Our product range includes a wide range of 785c mining trucks, 785d mining trucks, 789d mining trucks, 795f-ac mining trucks and 797f mining trucks. Our firm has gained continuous appreciation as the prime organization offering of 785C Mining Trucks. The engine configuration and performance of the trucks changes as per the model number. At our unit, we have specialized engineers who assist clients in buying the right kind of trucks for business and also provide after sale services. The offered trucks are equipped with a bucket, and hydraulic power operation and a heavy engine. Mostly, small trucks are used for loading sand or similar type of materials on the trucks in a construction project, or large construction. 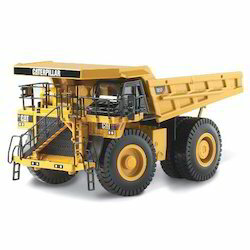 Our organization takes pleasure to introduce its business as one of the leading entity offering 785D Mining Trucks. The hydraulic trucks offer an operating weight of 8T. On mountain terrain or any construction site, these trucks deliver exclusive and impressive services to the clients. Such incredible service is provided by the trucks due to the large bucket size and sharp digger. In addition, the hydraulic trucks produce 98.03 horsepower in an operation. Our engineers assist clients in buying the required hydraulic trucks meeting their projects' needs. With the excellent support of our brilliant professionals, we are engaged in presenting 789D Mining Trucks. The offered trucks are loaded with the advanced engine, cooling technology, and high loaded bearing capacity. These trucks come with various models having different engine configurations. At any height or project, the offered trucks can reach any construct or support the ongoing task efficiently. Apart from this, clients can buy the trucks from us at reasonable rates and also can avail sales after services. 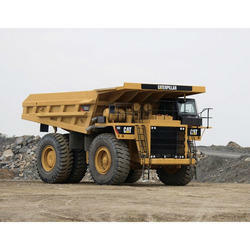 We are one of the noteworthy enterprises engaged in offering superior quality 795F-AC Mining Trucks. 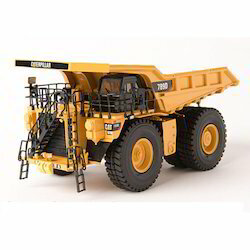 The mining trucks come with large bucket, advanced engine, and hydraulic equipment. These trucks are made available in various specifications meeting different needs of the business / projects. The trucks are perfectly designed considering length, height and total dimension at our vendor / manufacturer's end. In addition, Most of the trucks have hydraulic variable pump and motor. Bestowed with an ingenious team of engineers in the unit, we have been able to introduce an exclusive range of 797F Mining Trucks. The offered trucks are loaded with an advanced engine, cooling technology, and high loaded bearing capacity. At any height or project, the offered trucks can reach any construction or may support the ongoing task efficiently. These trucks come with various models having different engine configurations. Our engineers not only assist clients in choosing the right trucks for them but also offer after sales services.